Size Different sizes 12 to 72" inches. Shapes Round, Rectangular, Octagonal, Oval, Square etc. 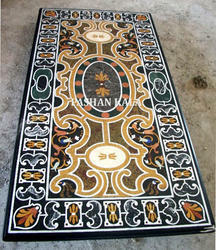 Marble and Stone Black, White, Green and Semi precious stones, Indian marbles, Italian marbles use for inlay. The beautifully carved Marble Dining Table Top are available in various size, shape and design. Finished to perfection, these Inlay Dining Table are available in attractive color. Inlay work is generally used for Table Tops, Dining Tables, side tables etc. We offer our range is in various color and design, which is hugely appreciated by our esteemed client. Marble Table Base for Dining Table can be purchased from us that are provided with excellently polished top. These are transformed into elegant designs, giving the table a classy look and enhancing the visual appeal of dining top. We bring forth for our clients an eye catching assortment of Marble Inlay Table Top. Available in sleek and trendy design, these Black Marble Table have excellent finish and sheen. These are provided in different designs, specifications, models, colour and pattern. We charge reasonable rate with our buyer. We are sell most popular marble adding beauty, convenience and effectiveness, they are one of the most important pieces of Marble Table Top Dining Table in any home, designed to stand normal wear and tear of use for many year, and they are available in different shape and size. Ideal for use in home, office and restaurants and cafeterias, these Dining Table Tops help to set the mood for the finished table setting. We export these Rectangular Marble Table Tops in various part of the country. Looking for Rectangular Table Tops ?